Happy December! It’s that time of year again: each winter, our friends at Caravan-Serai publish a series of Middle Eastern recipes guaranteed to delight! 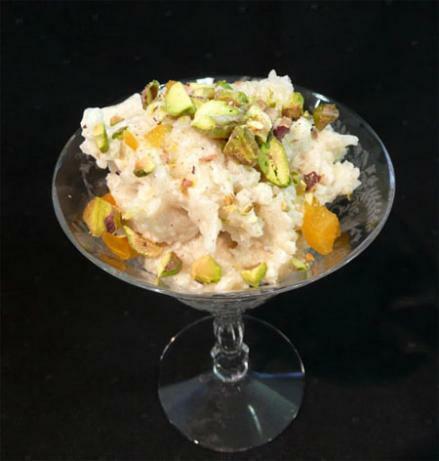 Try this specialty, Roz bil Halib, or Rice Pudding with Pistachios. Most cultures have some form of rice pudding. What makes this particular dish different is the addition of pistachios and rose or orange blossom water. There are two versions here – try them both this holiday season. This is a dish to make in advance. In a saucepan, combine milk, condensed milk & rice & bring to boil over medium heat. Reduce heat to maintain a low simmer & cook, stirring occasionally, for 10 minutes. Add cardamom, vanilla & 2/3 of the apricots, & cook until rice is tender, stirring occasionally, about 10 minutes. Stir in zest & cream, if using it. Garnish with pistachios & the remaining apricots, & serve warm or cold. If serving cold, press parchment/baking paper directly onto surface of pudding to prevent a skin from forming, & chill at least 3-4 hours (or overnight if desired).